NCRPO chief Director Guillermo Eleazar inspects P1.5 million worth of party drugs seized during a raid on a condominium in Makati City yesterday. 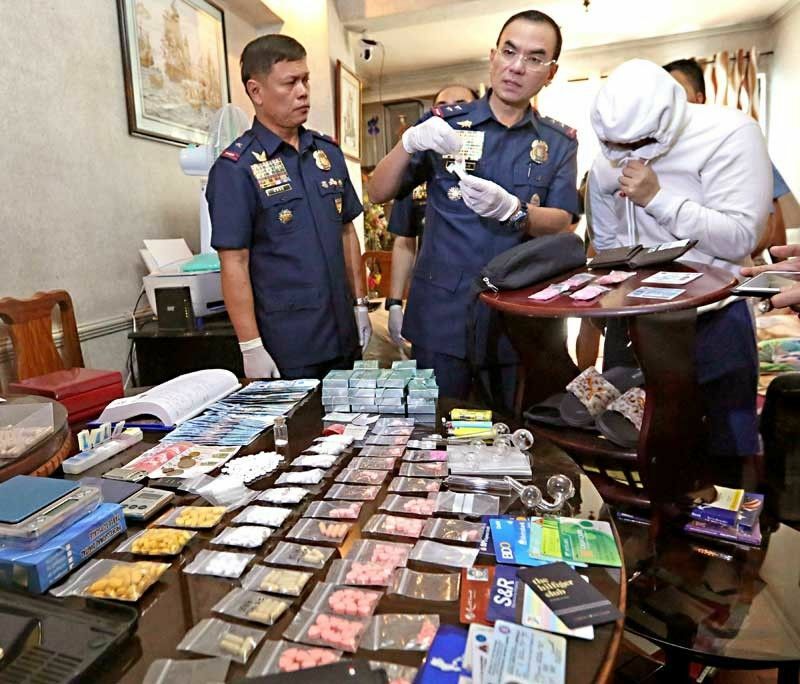 MANILA, Philippines — Two college students were arrested and some P1.5 million worth of party drugs were seized in Makati City yesterday. Ecstasy tablets, cocaine, methamphetamine hydrochloride or shabu and drug paraphernalia were confiscated from Filipino-Japanese Adriel Ryoichi Suzuki, 24, and Ralph Jeffrey Esteban, 23, at Cityland 9 Dela Rosa Condominium in Barangay Pio Del Pilar at around 7 a.m.
Suzuki is a student of De La Salle-College of St. Benilde while Esteban studies at De La Salle University. Director Guillermo Eleazar, chief of the National Capital Region Police Office (NCRPO), said the operation stemmed from a tip provided by a Grab Express driver whom the suspects hired to deliver a box to Bonifacio Global City in Taguig. The driver became suspicious when Suzuki refused to have the box opened for inspection. Instead of delivering the drugs to the intended recipient, he went to the police, Eleazar said. Policemen found seven ecstasy tablets inside the box, prompting them to raid Suzuki’s condominium unit. During the inventory, one of Suzuki’s alleged suppliers, Esteban, texted him about another delivery. Esteban was arrested in a sting at another unit within the condominium building. Meanwhile, the Dangerous Drugs Board (DDB) declared five barangays in Makati cleared of illegal drugs, the city government said in a statement yesterday. The DDB’s regional oversight committee on the barangay drug-clearing program announced that Barangays Bel-Air, Dasmariñas, Sta. Cruz, Pinagkaisahan and Post Proper Southside were cleared. This means that the five barangays met the following conditions: non-availability of drug supply; absence of drug transit activity; absence of clandestine drug laboratory, drug warehouse, chemical warehouse, marijuana cultivation site; absence of a drug den, dive or resort; absence of pushers, users and dependents; and absence of protectors, coddlers and financiers.